Up until now, I have worked only with acrylic paint, this enables it to be completely dry when I paint on top. Allowing me to finish this painting from start to finish in one week. The top of the picture looks very bare, so I start blocking in the tree. The great thing about art, as compared to photography, is that in a photo this tree and figure would be almost entirely silhouetted against a sunset. In a painting, I get to control the light, making it appear that much more colorful. Trees are painted in steps, a block in for the leaves furthest away, then put in the branches, then put leaves nearest on top, and that’s basically it. The trunk, I just think in terms of where that core shadow is and what the temperature is, it’s will be cooler than everything else, but avoiding purple, or it would get to out of control. I stay with earth tones and greens. 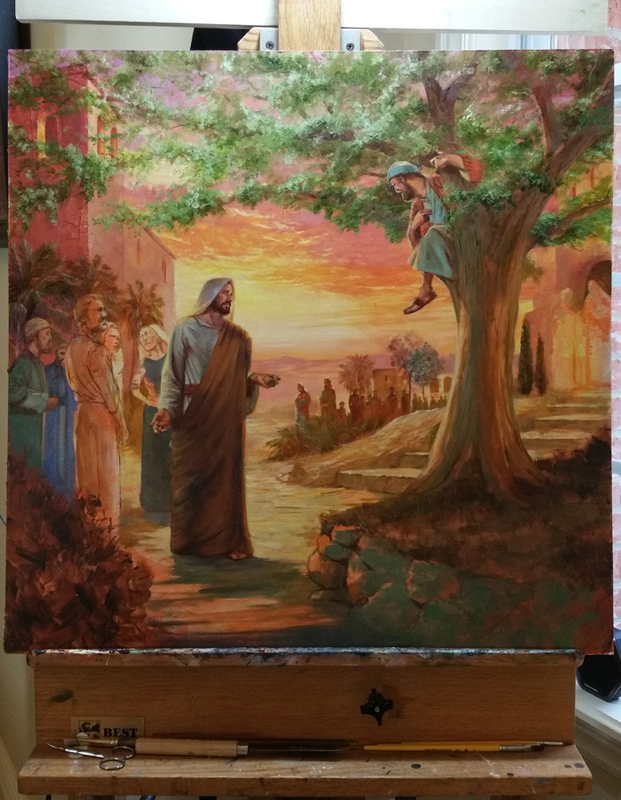 After the tree is established, but not finished, I move on to the figure of Jesus, or the focal point of the picture. I like to get the focal point done as early as I can, because everything will relate to that part. I have to be careful to choose contrasting colors, but not too “cool” for the clothing, and not too dark, but enough so it stands out from the light background. Nice neutrals against the high croma works both with contrast and makes the background appear brighter. At this point I need to work on the bottom or nearest foreground as well, adding in the shadows as well. I know in the lower left I will add flowers, so I can save that for later in the process. 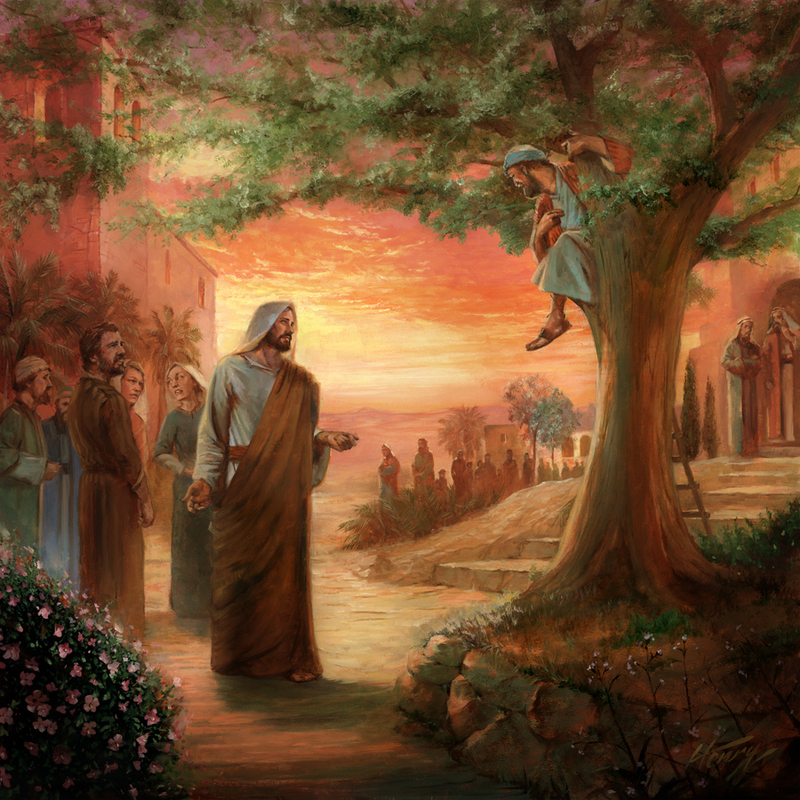 The background is painted, the buildings in the distance, the stairs behind the tree, all add to give the illusion of depth by overlapping. More texture is given to the grass around the base of the tree, as well as figure in the foreground are painted. I have two sets of brushes, one for “polished” brushwork, and some I call “scumblers” for grass and texture.